A Farsi language TV channel is to be launched by the BBC, targeting viewers in Iran with news and factual output. The £15m-a-year service is due to begin in early 2008, a few months after the start of a similar network in Arabic. Funding, from the Foreign Office, will be on top of the grant-in-aid sum paid each year to the BBC World Service. The free-to-air channel will complement the BBC's existing Farsi (Persian) radio and online output, Nigel Chapman, director of BBC World Service said. There will be eight hours of broadcasts each day - from 1700 to 0100 Iranian time (1330 to 2130 GMT) - to begin with. Although detailed planning has yet to begin, it is anticipated that the Farsi TV newsroom would be in London, Mr Chapman added. "We will be the first international broadcaster to deliver a Farsi tri-media news service under a single brand - the BBC." He said television was "increasingly dominating the way that millions of Iranian people receive their news" and promised the Farsi channel would be "editorially independent of the UK government". The BBC claimed about 2m Iranians listened to its existing customised radio service for Iran. And while its Persian website attracted 19m page impressions per month, access to the site had been "partially blocked on the orders of the Iranian authorities since January", the corporation added. 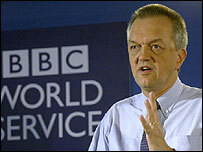 The BBC World Service currently receives £245m per year as its grant-in-aid contribution from the Foreign Office.